Most gardens have room for a tree, but if there is room for only one in your garden, which tree should it be? October is the best time to plant trees so if you are thinking about planting one and haven’t quite made up your mind, here’s a few ideas to help you choose. As with all important partnerships in life, it is best not to fall in love with a tree from a picture, far better to get to know what it might be like to live with first before you take the plunge. Consider how quickly they grow, how tall they will end up and in what sort of shape. Find out whether they have any annoying habits; Cherries’ roots frequently sucker, as do Robinias, and older, prominent Cherry roots often run along the surface ruining your lawn. Others are just messy, dropping; leaves, sap, fruit, nuts and twigs, so avoid planting trees such as Hawthorn, Crab Apple and Mulberrys near paths or terraces, the latter drops loads of fruit that will leave black stains wherever they fall. Also find out how reliable they will be; cherries are old at a mere 25 years of age, bits will drop off or die back and in many cases peg out shortly after. Trees are a big asset in a garden; providing light and shade, food and habitats, blocking out eyesores and creating privacy, as well as providing a succession of seasonal interest. As part of the garden design trees provide focal points and vertical accents within the planting. Trees positioned at the end of a path act as focal points enticing you into a garden to explore. Without vertical accents within a garden design the planting can tend to look flat and listless with everything merging together, upright features such as trees, provide focus and energy, lifting the eyes upward and creating a sense of composition to the whole design. with a combination of attractive blossom, colourful fruit, autumn colour or striking bark. 1. Paperbark maple Acer griseum, offers a great shape, superb autumn colour and shaggy, peeling, gingery bark that shows up best in winter. It is a slow growing, hardy tree with, lovely peeling bark once established, interesting summer foliage and great autumn colour. 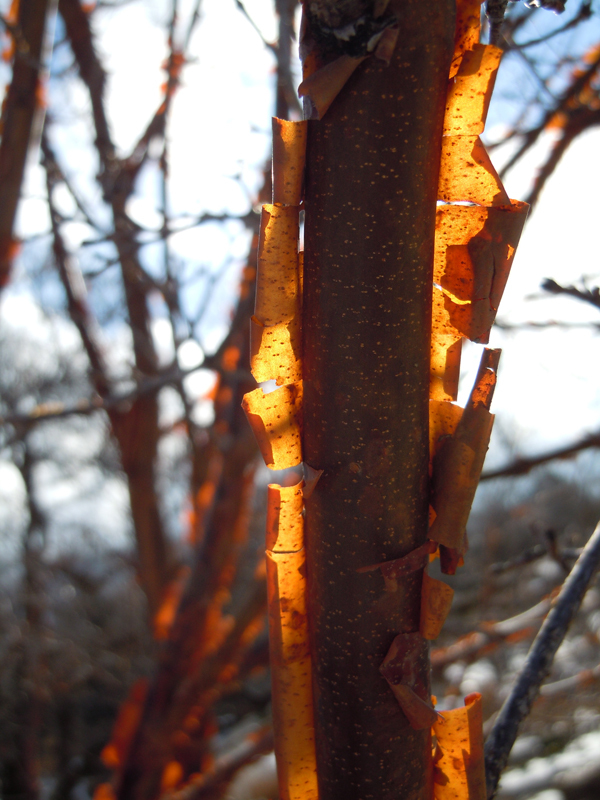 The ornamental bark makes established specimens breathtaking all year round. 2. Judas tree Cercis siliquastrum, produces pink pea-flowers that sprout straight from the branches and trunk, before the heart-shaped leaves appear. These are followed by red pods. 3. Amelanchier lamarckii– possibly the best small-garden tree, it is tough, hardy and has masses of white spring flowers, followed by fluttery leaves that are translucent pink but quickly turn green and then red in the autumn, in June small maroon fruit appear that are loved by birds. Because their bark looks good all year, Birches are splendidly ornamental, they have catkins in the spring which the birds love and have wonderful autumn leaves. The Himalayan Birch is a medium-sized tree with chalk-white papery bark that peels in bands to reveal a new skin in warm shades of cream or pink buff, distinctively marked with horizontal dashes. The leaves are dark green, with paler undersides that cause the tree to shimmer when stirred by a breeze. Buttery yellow in the autumn, some leaves turn toffee-coloured as they fall. Catkins abound in the spring. Plant singly as a focal point or, in groups of three. On frosty winter days the white bark and architectural shape, creates a dramatic skeletal silohouette. A compact Japanese maple with brilliant orange-scarlet autumn colour. 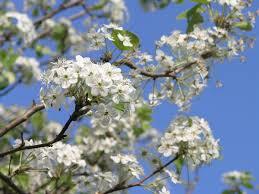 Mountain ash forms a compact tree with spring flowers, attractive foliage and autumn berries. It is a very neat tree,with ferny foliage and berries that change colour the wrong way round — from red to pink and then white. 7. Callery Pear Pyrus calleryana ‘Chanticleer’, forms a narrow, upright column and is clad in wonderful pear blossom in spring, with good foliage that colours up well in autumn. will both give you plenty of ideas and inspiration.